Editor’s Note: I thought it would be a challenge to find Mike for this interview. It wasn’t hard. I made a shout out to my old skateboard friends, got a lead, and there he was. I did this interview in 2011. He was happily living on Maui with his wife and son. He was working, surfing, with an occasional skatepark run – when he wants to. It was a pleasure to talk with him on the phone and he readily agreed to the following interview. Some of the questions are mine. Some are from a former Hobie Amateur Team member, Barb Odanaka, who knew Mike back in the day and had a few questions of her own. Di – When did you start skateboarding? Mike – I started in 1965 on the hills of Laguna Beach. I was on the Hobie surf team in 1970, and they put a skateboard team together in 1975. I was one of the first members. I dropped out of high school in 1975 to be a pro skateboarder. It lasted until 1980 for me. It was the beginning of what would become a worldwide sport. The first time I skated a pool was the San Juan pool. I had never seen anyone ride vert before that day. The second time I went, Warren Bolster did a photo session. It was the first time I tried a kickturn on vert. 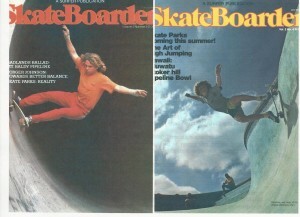 I ended up getting the cover of Skateboarder with one of those first couple of kickturns. That was the start of my career. Di – When did you go to La Costa? Mike – I remember the first time we went, it was to Black Hill. No one else was there that day. We were there to film for “Spinnin’ Wheels”. It was 1975. Skitch Hitchcock, Gary Hitchcock, and I were ready for some speed runs. We had the car with the photographer in it follow us so we could figure out how fast we were going. We tightened our trucks and started pushing as hard as we could. I went 50m.p.h. with loose ball bearings. I never went that fast again on a skateboard. I was a bank and bowl rider and would start freestyle skating a month or so later. Gary was the speed man. He was fearless and was heavier than Skitch or I. He had the perfect technique for speed runs. After a few runs, Gary started getting towed by the car at the top of the hill. After he let go, he went 60m.p.h. with bare feet and no helmet or pads (we hadn’t started using that stuff yet). That day we left La Costa on such a high with no injuries, no pressure, just skateboarders skating for the fun of it. Later I skated slalom races at La Costa and had a blast. I took second in the GS. That was my best time in slalom. I prided myself in being an all around skater, but slalom was my weakness. I wish I could have been at more of those races, but you can’t be in two places at once. Barb – In the pantheon of skateboarding history, where would you place yourself, Skitch Hitchcock, and other Orange County pioneers compared to other scenes of that time? Mike – I would day we contributed a lot to the pioneer days of skateboarding. Skitch won the first world contest in freestyle. Ed Nadalin and I were always in the running for the world contests. If I remember correctly we placed high in every one except 1975 which Skitch won. Ed was an amazing freestyler and didn’t get the coverage he deserved. Skitch did the first real airs on flat ground and off a launch ramp. He deserves a lot of credit for that. We did demo’s all over the world exposing people to skateboarding in the early days. Bob Skoldberg and Gregg Weaver were not from the OC, but were important members of the Hobie team. Bob was the man in slalom and in speed, and a lot of fun to travel with. Gregg Weaver was simply the most stylish skater on the planet. Were we as good as the Dogtown boys? That’s hard to say. We could beat them in freestyle, but they totally ripped pools and skateparks. Di – What was your worst memory? Mike – My worst memory has to be the end of my career. I came back from six weeks in touring Argentina and found out I didn’t have a job. First, Hobie went into Chapter 11 bankruptcy the year before. Then we started Bad Co. and the Weed Wheel. The economy was just really slow. So the boss said he was going bankrupt. I had to give back my leased truck and he didn’t have the $10,000 he owed me. I said I am going to get a new backer for the Weed Wheel and he said “No, you aren’t. I trademarked it and you can’t use it”. I threw in the towel after that. Barb – if you could go back in time, is there one moment you would change? Mike – If I could go back, it would be for the third pool riding contest of the Henry Hester Series in 1978. This time I would take it easy and get used to the pool and then skate well in the main event. Instead, on my second run I broke my collarbone and was knocked out of any chance of winning that Series. Di – Where has life taken you after skateboarding? Mike – After things went sour with my skate career, I went to Oah’u’s North Shore for the winter and surfed Pipeline and Sunset. I got stoked on surfing again. I didn’t really skate much for five years or so. Then in 1985 I moved to Maui and met Leslie and got married a couple years later. We have a son named Richie who is 16 years old. He likes to surf and skate. I am still skating once in a while; mostly surfing, though. I have been a bartender at the Pioneer Inn for about 12 years. Maui is a great place to live and we feel lucky to own a home here on the west side. Di – You had so many contacts with others that made a difference in your life, who would you like to thank? Mike- Thanks to Skitch for showing me how to do an end-over up a curb long before I ever dreamed of being a pro; and for all the skateboards he made. He was always designing something new. Thanks to Bob Skoldberg for traveling around the world with me and keeping us in line. Thanks to Bruce Logan for showing us the first nose wheelie we had seen. Thanks to Bob Mohr for showing me the proper way to high jump. Thanks to TA (Tony Alva) for being a rival that pushed me; and for showing me some new lines in the San Juan pool. Thanks for D. Hackett for keeping in touch and inspiring me to keep skating. In the mid-80’s skateboarding made a big come back. Cab, Hawk, and Hossoi were my favorites. Thanks to all the amazing skaters for pushing skateboarding beyond anything we thought would be possible. Editor’s Note: It was a pleasure working with Mike on this interview. The pictures used are the ones he provided. He was as nice as ever and I am glad to know he has been happy and in charge of his own life. This interview was first published on my website in 2011. I lost it when I changed website formats. I discovered the loss upon Mike’s death on September 9, 2014 and have re-created it to honor him and provide a little insight into this wonderful man. If you would like to reach Mike’s family, use http://mikeweedskateboarder.com/. He was a hella skater and a hella great guy. RIP, my friend.